Mission: To develop and provide technologies, educational programs, and patient-care solutions that enhance visual health and performance for people in Orange County, the nation and the world through cooperation with medical professionals, industry and the community. 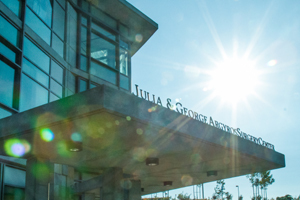 Eight UCI Health eye specialists are named “Best Doctors in America®”: Swaraj Bose, MBBS; Marjan Farid, MD; Sumit (Sam) Garg, MD; Baruch D. Kuppermann, MD, PhD; Linda Lippa, MD; Sameh Mosaed, MD; Jennifer L. Simpson, MD; Roger F. Steinert, MD. Our innovators hold seven U.S. patents for discoveries and developments related to eye health. Our eye specialists were the first in Orange County to implant a miniature telescope to improve vision in patients with end-stage age-related macular degeneration. Our eye specialists pioneered use of a femtosecond laser for a laser-based approach to corneal transplant surgery, replacing the steel blade. Contractor: Hathaway Dinwiddie Construction Co.